Lillian Davenport Freund, known to many as Lil, died at home surrounded by her loving family on July 17, 2018. Born August 15, 1925 in Newark, New Jersey to Christopher and Mary Davenport, Lil was one of eleven children. Shortly after she graduated from Hillside High School in 1943, she met her husband Ted Freund Jr. at Old First Presbyterian Church in Newark. They married in 1950 after his service in World War II. Together they raised two children, Robert and Jane, in Livingston, where they lived for over 35 years. Lil worked at Midlantic National Bank in West Orange for 20 years where every customer knew her for her friendly and efficient manner. She also volunteered with various political campaigns and at voting sites in the community. In 1988, Lil and Ted relocated to Lancaster to be closer to family. Lil enjoyed riding her bike and making new friends at their home in Valleybrook Estates. For the last five years, she lived at The Long Community where she often could be found at the puzzle table or playing games with her many wonderful neighbors. Lil had a quick mind and she took pride in solving the New York Times Mini-Puzzle and winning at Scrabble. Throughout her life, Lil often stepped forward to care for family members or friends in need. She nursed her younger brother through rheumatic fever following the deaths of their parents, and helped to care for her nephew with leukemia, as well as for her sister after a traumatic injury. Most notably, she cared for her husband Ted, who suffered from multiple sclerosis, for over forty years. Through these challenges, Lil never complained and approached each day with gratitude and an incomparable sense of humor. A lifelong Presbyterian and a member of First Presbyterian Church in Lancaster, Lil’s faith was a central part of her life. Lil was an avid Penn State football fan, loved to visit the Jersey Shore, and was happiest when spending time with family. 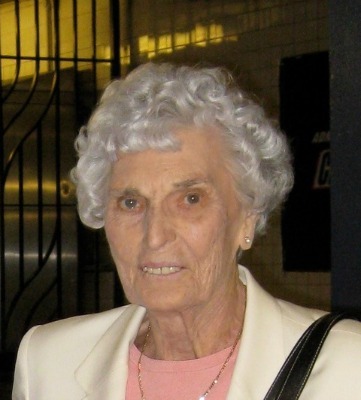 She enjoyed exercise and worked out regularly at Universal Athletic Club until the age of 90. She was known to enjoy the occasional trip to the horse races or to the casino to play the slots, but always quit while she was ahead. She is survived by son Robert (Joanne) Freund and granddaughters Meg Freund Reed and Kelly Freund, and by daughter Jane (Jean Baynes) Freund and granddaughter Anna Baynes. A Celebration of Life will be held at the Long Community of Highland, 600 E. Roseville Rd., Lancaster on Saturday, August 18 at 11 a.m. with Pastor Dan Snyder of First Presbyterian Church officiating. Light refreshments will follow at the Long Community for family and friends. Interment will be private. In lieu of flowers, memorial gifts may be made to Hospice and Community Care of Lancaster or Horizons at Lancaster Country Day School, an educational program for low-income youth. I am so sorry for your family’s loss of Lillian. May you find comfort in the many precious memories you shared as well as God’s promise to restore our dear loved ones to perfect life on a paradise earth. ( Psalm 37:29- Revelation 21:3,4) As you contemplate this promise, draw close to God in prayer and he will draw close to you and provide the needed strength to carry you through the difficult days ahead. I wish the very best for your family at this time, take care. Lillian was a delightful, caring and joyful friend. Her presence warmed the room and shared grace that overflowed from all she received. Blessings on you all as you remember and celebrate her. Lillian was the kindest, sweetest person. Always smiling and stayed positive. You are missed my friend.